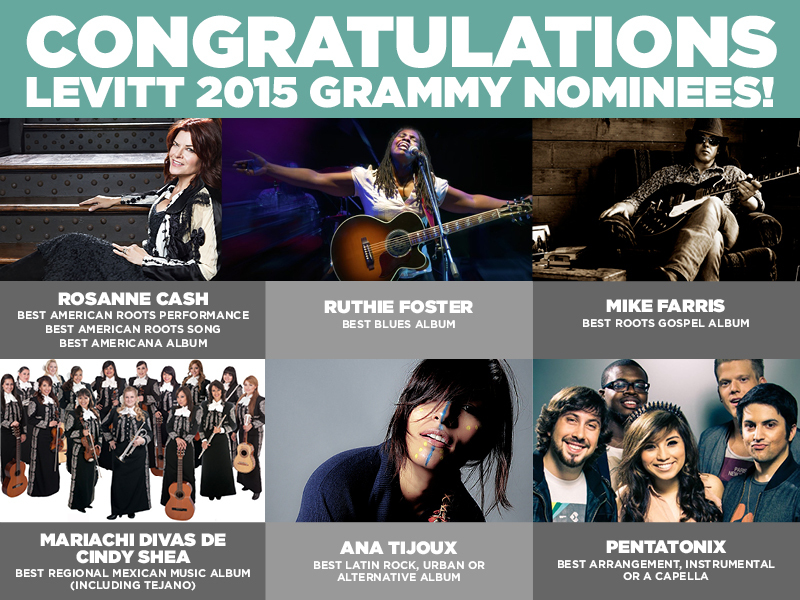 Cheer for these GRAMMY Nominated Levitt Artists! Today we’re shining the spotlight on these amazing artists—learn more about them and their music before the ceremony! Rosanne Cash, the eldest daughter of the legendary Johnny Cash, has forged a successful musical career in country, roots, folk, pop and blues over the past four decades. Born in Memphis, she toured with her father as a background singer before releasing her first album in 1978. Since then, Cash has been nominated for 15 GRAMMYs, winning in 1985 for Best Female Country Vocal Performance. Her latest album, The River & the Thread, was inspired by her travels to restore her father’s childhood home, and has been critically acclaimed as an emotional exploration of her family’s legacy as well as that of the American South. Born and raised in Gause, TX, the phenomenal Ruthie Foster comes from a family of gospel singers, whose influence can still be felt in her soulful, emotive voice. Before becoming a recording artist, she completed a tour of duty with the U.S. Navy Band, and she has released nine blues and folk albums since 1997. For her music, Foster has won multiple Blues Music Awards including the Koko Taylor Award for Traditional Blues Female Artist of the Year and Contemporary Blues Female Artist of the Year. Promise of a Brand New Day is her third GRAMMY nomination in a row. The daughter of Chilean exiles who fled to France, Ana Tijoux first rose to fame as the frontwoman and co-founder of influential Chilean rap group Makiza. After they disbanded in 2006, Tijoux launched her career as a solo artist, and her sophomore album 1977 received international acclaim in 2009. Her music, which combines deeply moving autobiographical lyrics with influences from classic hip-hop, has been nominated for multiple GRAMMY and Latin GRAMMY awards. Most recently, she won the 2014 Latin GRAMMY for Record of the Year for “Sacar La Voz,” her collaboration with Jorge Drexler. True to their name, the Mariachi Divas de Cindy Shea is the all-female, multicultural Los Angeles-based ensemble founded by trumpet player Cindy Shea in 1999. Formed in reaction to the traditionally male-dominated mariachi scene, the Mariachi Divas have risen to prominence as the official mariachi band of Disneyland Resort and have regularly performed there since 2003. The first all-female mariachi group to be nominated for the GRAMMYs and win, they have been nominated five times and won twice in the category of Best Regional Mexican Music Album over the span of their career. Originally from Arlington, TX, Pentatonix is the young, five-person a capella group that first achieved fame after winning the third season of NBC’s vocal competition The Sing-Off. Since then they’ve launched an impressive social media presence with their pop music covers, gathering over 7 million subscribers on YouTube. Pentatonix has achieved unprecedented success for a modern a capella group, with their latest album, That’s Christmas to Me, selling over a million copies to become the fourth bestselling album of 2014. “Daft Punk,” their medley paying homage to the iconic French electronic music duo, is their first GRAMMY nomination. Mike Farris almost never became an acclaimed gospel and soul musician; he overdosed and nearly died before he turned 21. Even as his career was taking off with performances at major festivals Bonnaroo and SXSW and awards like the Americana Music Association’s New & Emerging Artist of the Year, he continued to struggle with addiction, but he has since kicked the habit and begun a life of recovery. His latest album, Shine For All The People, takes his hardships as fuel and aims to transform people from all walks of life with the power of music—particularly “the downtrodden, the wayward…people who’ve had to go up the rough side of the mountain.” This is his first GRAMMY nomination. Congratulations to these incredible Levitt artists—we’ll be cheering for them this Sunday! Are you watching the GRAMMYs? Let us know who you’re rooting for!